NOTICE (09/09/2014) Data collection and real-time delivery at this streamgage have been discontinued as of October 1, 2014 due to insufficient funding. No new data will be collected and real-time data will not be delivered unless one or more new funding partners are found. 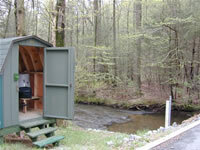 Users who are willing to contribute funding to continue operation of this streamgage should contact Marla Stuckey, Assistant Director of the USGS Pennsylvania Water Science Center, at 717-730-6950 or by e-mail at mstuckey@usgs.gov. LOCATION.--Lat 40`26'20", long 76`35'55", Lebanon County, Hydrologic Unit 02050305, on left bank, 10 ft downstream from Lake Road bridge over Indiantown Run, 20 ft west of State Highway 443 in Indiantown Gap Military Reservation, 1,500 ft upstream from Marquette Lake, 1.9 mi upstream from State Memorial Lake dam and 2.5 mi north of Harper Tavern. PERIOD OF RECORD.--August 2002 to current year. GAGE.--Water-stage recorder. Datum of gage is 530 ft above National Geodetic Vertical Datum of 1929, from topographic map. COOPERATION.--Funding for the operation of this station is provided by the Pennsylvania Department of Military and Veterans Affairs and the U.S. Geological Survey.